Eloise has kept her desires in the dark her entire life. Not sure if she should feel ashamed over her need to have a sexual relationship that consists of pain, she focuses on keeping to herself, knowing that she can never have what she really wants. 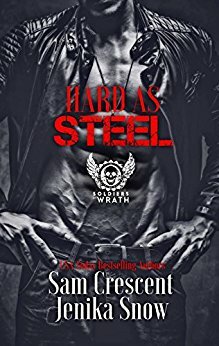 Steel is a member of The Soldiers of Wrath MC. He is a man that takes what he wants when he wants it; he is never denied. But he wants Eloise, and her refusal to give herself to him makes Steel want her even more. He’s determined to break the composed and collected exterior that she carries. When Hanson, Eloise’s boss, attacks her, it’s Steel that comes and rescues her. Steel feels something for the woman that’s seemed to turn his world upside down in such a short time. But Hanson isn’t about to be put in his place, or lay down without a fight. He’ll show Eloise and Steel that he’ll take what he wants regardless of any threat. Can Eloise give herself to Steel fully, or will her fear for what she really wants hold her back? Can Steel finally allow himself to commit to a woman and show her that what she wants is exactly what he desires to give her?